AKIPRESS.COM - On March 19, 2019, the U.S. Government through the United States Agency for International Development (USAID) donated 110,257 children’s books to 900 public primary schools across the Kyrgyz Republic, the US Embassy said. The donation includes 32 unique titles in the Kyrgyz and Russian languages. They include fairy tales, stories, and poems, many of which have math theme. The 110,257 books being donated were all printed as part of USAID’s Time to Read program. The donation was made official during an event attended by Minister of Education and Science Gulmira Kudaiberdieva and USAID/Kyrgyz Republic Mission Director Gary Linden attended the event. “These books will instill a love of reading in the lives of children, encourage regular reading habits, and improve their overall reading skills,” said Gary Linden during his speech at the ceremony. These books are the first printed “leveled books” in Kyrgyzstan. This means that they were evaluated using a new tool that assesses their difficulty level to help teachers, parents, and librarians to select titles that are most appropriate for children’s age and grade. “The books were evaluated and recommended for printing by a special expert task force which was approved by the Ministry” said Minister of Education during the ceremony. Ms. Gulmira Kudaiberdieva emphasized that this donation will significantly expand school library collections with quality literature. 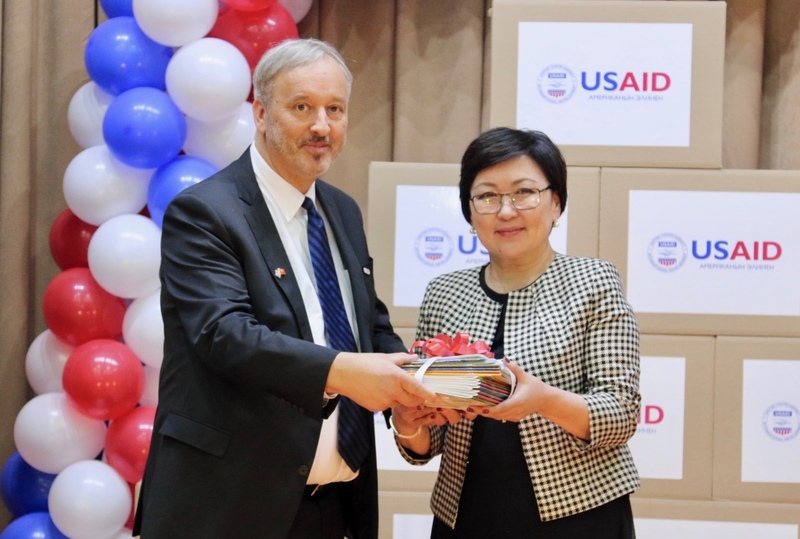 This donation is the first of a total of 1.2 million books that USAID plans to print and distribute in Kyrgyzstan by 2020 under the Time to Read program. The USAID Time to Read program is a $9.9 million initiative over four years implemented in cooperation with the Ministry of Education and Science of the Kyrgyz Republic. The program is designed to improve the reading skills of children in the country. Since 2014, USAID has trained 17,500 primary school teachers on innovative methods of teaching reading. These new methods are benefiting over 450,000 schoolchildren across Kyrgyzstan.